The Diamond Museum (Diamant Museum) in Amsterdam is a diamond-themed museum located in the city’s museum quarter with displays on diamonds and the diamond industry. Amsterdam has always been one of the centres of the world diamond trade. This museum was actually set up by the owner of Coster Diamonds (next-door) which has been trading since 1840. The museum is actually quite informative and well set-up. On entry to the exhibition there is a short introductory film about the origin of diamonds – how diamonds are created deep below the earth’s surface by extreme pressure and brought up to the near-surface by flowing magma. Over 2 floors there are exhibits on various aspects of the industry – mining, polishing, the classification of diamonds, the diamond cartel and market, the Dutch royal house, the 400 year history of diamonds in Amsterdam, notable diamond robberies and famous diamonds. Items on display include old goldsmith tools, a copy of Van Gogh’s Starry Night encrusted with 504 diamonds and many diamond replicas such as Dutch Princess Maxima’s wedding tiara. There is a kitschy mirror lined ‘Glamour Room’ playing videos and music – you are guaranteed to hear Shirley Bassey’s “Diamonds Are Forever”! 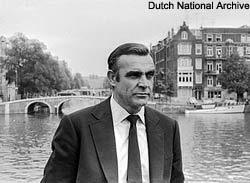 Trivia side note: The James Bond film Diamonds Are Forever (1971) was partly filmed in Amsterdam. In the film James Bond (played by Sean Connery) visits the 3rd floor apartment of Tiffany Case (Jill St John). This building can be found at Reguliersgracht 36 – not far from Rembrandtplein. Exhibitions are clearly presented in English while various films can be played in both Dutch and English. Temporary exhibitions are housed on the top floor. There is a small cafe on the ground floor and a shop – there is no hard sell here though if you are also looking to buy diamonds you can go next door to the Coster Diamonds showroom for a tour and browse. It is also possible to undertake a basic diamond course (€475) where you can learn how to cut and polish a diamond – note, this is offered for fun rather than educational purposes. Admission Prices (2019) €10.00 for adults, €7.50 for children 13-18, seniors 65+ and students. FREE entry for children 0-12, Museumkaart and Iamsterdam City Card holders. Getting There The Diamond Museum is located in a villa on Paulus Potterstraat, across the road from the Van Gogh Museum. From Amsterdam Central, trams 2, 12 and 24 stop at the nearby Rijksmuseum.